Bluetooth technology in the car. 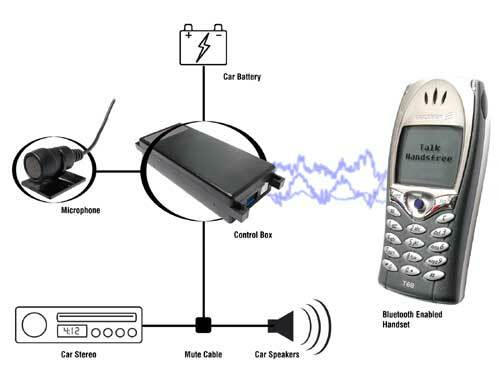 Bluetooth is a system that connects electronic devices via wireless radio technology. This means that handsfree devices can communicate directly with the phone without having wires plugged in. The range of Bluetooth is up to 10 metres - so when you get in the car, you can leave your mobile in your pocket or handbag and be instantly handsfree! Plug-and-Go Blue Tooth hands free system. The first installation-free quality car kit designed and priced as a consumer electronic product. Plug it into the cigarette-lighter jack of your car to instantly and wirelessly operate your Bluetooth phone in handsfree mode. Simply plug this device into your cigarette lighter socket. Fully installed Blue Tooth hands free system utilising car radio speakers. Most components, once installed, are hidden from view. One advantage of a wireless handsfree is the neat installation. The audio is routed through the car stereo front speakers and all other components are hidden, with the exception of the microphone. Our Bluetooth handsfree incorporates voice recognition technology for up to 500 names and up to 3 phones*. Once programmed simply say the persons name and the handsfree will dial the number. You can also answer and hang up calls by voice alone. This means you may never have to take your hands off the wheel again! Harald Bluetooth was the king of Denmark during the late 900s. Harald united Denmark and part of Norway into a single kingdom and also introduced Christianity into Denmark. He also left a large monument, the Jelling rune stone, in memory of his parents. In 986 during a battle with his son, Svend Forkbeard, Harald was killed. The name Bluetooth was chosen to indicate the importance the part companies from the Baltic region (nations including Denmark, Sweden, Norway and Finland) have played in the communications industry, although it gives no indication of how the system and technology operates.